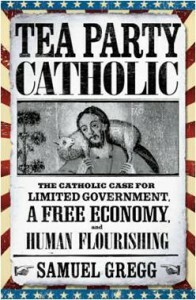 Tea Party Catholic, the latest book by Acton’s Director of Research Sam Gregg, continues to garner attention. Fr. Gregory Jensen, at his Koinonia blog, reviews Gregg’s work in light of the experience of Orthodox Christians in the U.S.
For the American Orthodox Christian, patriotism, “the love of the true good of one’s country” is the core of the Church vocation relative to the larger culture. We cannot evangelize, as I’ve said before, those we don’t know, but we don’t truly know those we don’t love. Additionally, American Orthodox Christians can’t makes a lasting contribution to the Church in the Middle East, Greece, Eastern Europe or Russia if we don’t love those true and lasting goods that inform the American Experiment at its best. This doesn’t mean we are called to export American democracy. But we can, and should, witness to how our own experiences in a secular democracy have helped and hindered our own commitment to the Gospel of our Lord, God and Savior Jesus Christ. No matter where we were born, no matter what our ethnic heritage, our personal and ecclesial vocations as Orthodox Christians here in America can only be fulfilled as “Orthodox and American, American and Orthodox.” But this requires, if I may repeat myself, that are we not only faithful Orthodox Christians but patriotic Americans. On these last two words, on this smallest part of our calling as Orthodox Christians in America, Gregg has offered us a great service. He has not only explained and defended an orthodox Catholic (and so, catholic Orthodox) vision of the American Experiment, he has also more importantly laid out the moral limits beyond which freedom becomes slavery and liberty license. Read “Book Review: Tea Party Catholic? Really?” at Koinonia. Video: Is the Tea Party Catholic?